Congratulations to Chris Kemp-Philp, who won the Historytellers 14-book set from 12 historical fiction authors! And much gratitude to everyone who participated in the Historytellers Scavenger Hunt. Thanks to you, it was the bee's knees! As promised in my last post, welcome to the Historytellers Scavenger Hunt! This hunt is dedicated to novels historically set in the 1910s, 1920s and 1930s, across all genres. You’ll have the opportunity to discover new authors, new stories, and to meet other readers who love this time period--not to mention, you’ll be eligible to win the grand prize, which includes a digital copy of all the novels participating in the hunt! Directions: I’ve included my lucky number in this post (you will definitely spot it!). All my fellow authors participating in the hunt will also include a lucky number in their posts. Collect all of these numbers and add them up. Entry Form: When you have that lucky total number, make sure you fill out the form below (or here) to officially qualify for the grand prize. Only entries with the correct number will qualify. Rules: Anyone can take part. To be eligible for the grand prize, you must submit the completed entry form by 23:59 EST on Sunday, 17 March. Entries sent without the correct number or without contact information will not be considered. I'm probably the most social recluse you could ever meet. When not babbling my fool head off among friends and family, I'm pacified with a good story that I'm reading, writing, or revising--or binge-watching Buffy. Hailing from Chicago, I presently live in London with my husband and probably a ghost or two. I've always had a penchant for the past and paranormal, which inspires my writing to explore dimensions of time, love, and the soul. My award-winning work includes Coattails and Cocktails (First Prize Winner, 2018 Red City Review Book Awards) and What the Clocks Know (First Place Winner in General Fiction, 2017 Red City Review Book Awards). Coming up next is the novel up for grabs in the HISTORYTELLERS Scavenger Hunt Grand Prize! Summer, 1929. Murder isn't on the menu when Chicago tycoon Ransom Warne hosts a dinner party at his country estate. But someone's a victim--and everyone's a suspect--when drinks and desires lead to disaster. Hollywood starlet Lottie Landry has returned home to celebrate her engagement. She's famous for her on- and off-screen romance with co-star Noble, but, privately, she's having second thoughts. As her former guardian, Ransom doesn't approve of the match. Yet his own affections raise questions when his wife, Edith, suspects him of having an affair--just as Noble suspects Lottie. Stirred into the mix are Lottie's friends Helen and Rex, a young journalist and football hero who can feel tension building in the Warne mansion like a shaken champagne bottle. 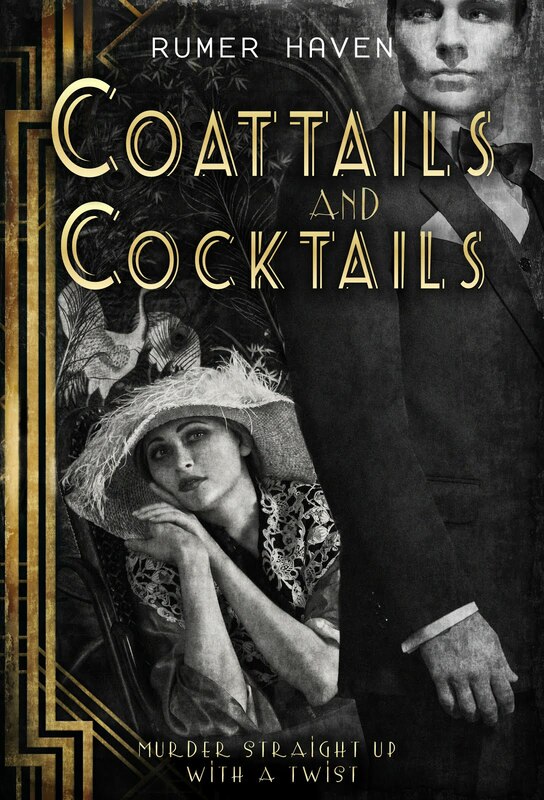 Coattails and Cocktails is where Agatha Christie meets The Great Gatsby, a whodunit spiked with new love and old baggage, public faces and private vices. Filled to the brim with romance and mystery, it's sure to intoxicate. As part of this scavenger hunt, I have happily agreed to share some exclusive, never-before-seen content. While Coattails and Cocktails is 100% historical fiction, my next book will be set in modern day but with some flashbacks to a past era. Unfortunately, I haven't drafted those bits yet, but what I can offer today is a draft scene set at a murder-mystery dinner, in which my contemporary characters role play as 1940s murder suspects. 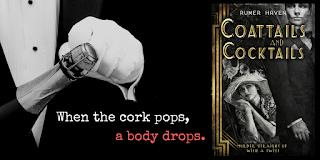 So, to be clear, this is not an excerpt from Coattails and Cocktails, the historical murder mystery featured above as my contribution to today's Grand Prize--which also happens to be accessible to anyone at any time at Amazon. No, ma'ams and sirs, what follows below is from a story I am still slowly but surely writing about a modern-day mystery dinner game--and no one's eyes but mine have read this yet! “Why would the maid announce this?” Kelly murmured to Greer out the side of his mouth. The group now stood in a circle within the dim confines of the parlor, painted a peacock blue and upholstered within an inch of its life with pale floral patterns. Porcelain kitsch cluttered every available surface of the mahogany furnishings. Catching Aubrey’s nervous glance, Greer elbowed Kelly in his side to shut up. Aubrey had organized the whole thing, so it made sense for her to kick things off. But for all her insistence that everyone get in character straight away, it did seem odd that Aubrey wouldn’t have just made Stacey and herself the master and mistress of the house to jive with the story better. Greer refused to comment, though, so her brother just rolled his eyes and turned his attention back to the empowered housemaid. “I hope you all had safe journeys and settled in well,” Aubrey continued. “Anyone need a drink?” Raising her chin, she looked around, and to Stacey’s evident relief, everyone seemed all set. The “butler” had followed his orders, as dictated by the real master of the house here. Granted, Greer and the last to arrive—Ken and Sadie—had never gotten a chance to grab their drinks, and Aubrey herself still only clutched the feather duster. Hopefully Stacey wouldn’t catch heat for that; it was kind of Aubrey’s fault, after all, for holding them up in the foyer and then rushing them into the parlor to the start the game. But Greer wasn’t much of a drinker anyway and could easily wait until everyone sat for dinner. She knew Ken was too polite to make a fuss, too, and true to form, he didn’t. She knew quite a lot of things about Ken, and she wondered if Sadie did yet. If this new woman on his arm had even a fraction of the history Greer had shared with him before he’d broken her heart. But whatever. Like she’d told Aubrey only moments ago, she’d moved on and would be happy for Ken if he was happy with Sadie. Yep, she was one big happy-fest as her face grew hotter and hotter beneath her fedora. Her thick suit was so warm, too, in this musty old place. Really putting the fried in her Girl Friday. Spence’s date must’ve been boiling in her cheap white synthetic wig and opera gloves, too. Yet Rita kept smiling and sipping her white wine, so it must’ve been true that even fake blondes have more fun. A scuffling sound to Greer’s right broke her thoughts and alerted her to Anna, who’d appeared from nowhere now wearing a black pillbox hat with crinkled netting hanging awkwardly over one eye. Anna fidgeted with her apron, in which she’d tucked a length of shiny brocade fabric partially around her waist, presumably as part of a costume. Was she playing the game, too, then? Hadn’t she said in the foyer her last name was Bosworth? “Ferry? Out here in the prairie?” Kelly muttered before Greer elbowed him again. 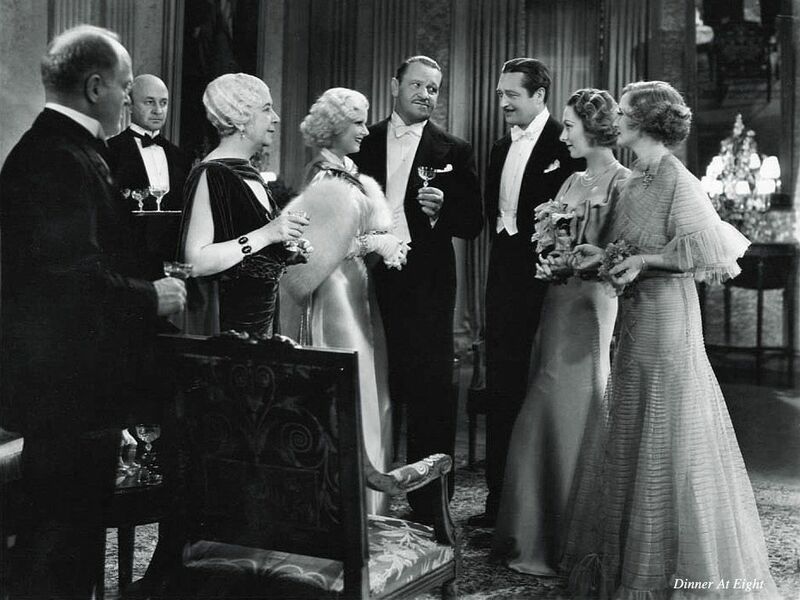 As Greer looked around at everyone else looking around at each other, clueless, Aubrey continued, “Oh, and we all know that you’re here because our illustrious host, Mr. Phil Theeritch, has invited you to discuss the new film he’s financing.” She stared intently at Ken. Ken’s hand scrambled around in his tuxedo pocket until Sadie calmly handed him the crisp black-and-gold card she’d removed from her black beaded purse. “I guess you do vant attention, Ivanna,” Spence teased. “Speaking out of turn.” He gave her a playful spank as punishment, which she laughed off with a diminished smile. “And what is it that you do, Mr. Dunnit?” Sadie asked, showing initiative. A sign, Greer thought, that Erma Candy wouldn’t be content just playing “arm candy” tonight. Beneath that dark, lustrous, Victory-Rolled hair was probably a big, beautiful brain if Ken had stuck with her this long. Well then, Berry DeLeed would just have to up her game. Greer heard her character’s name just then, as Spence explained to Rita on the side what it meant to “bury the lead” in journalism. And also cackle that brother and sister were on a “date” tonight. Kelly, who’d started to answer Sadie's question, interrupted himself to point at Spence. “Watch it,” he said with mock—though probably pretty real—aggravation. Greer’s stomach dropped at “my husband.” She’s only acting in character, she’s only acting in character, she’s only acting in character, she reminded herself. Boy, now Greer wished she did have that drink already. She crossed her arms and dug her thick high heel into the old matted carpet instead. Anna had just been milling around quietly in the periphery of the group, looking anxiously now and then toward the foyer. But once summoned by Aubrey, she snapped to attention and, lifting away that swathe of tacky brocade, fished a folded piece of glossy white paper out of her apron pocket and began to read it in monotone. “‘I, Anita Job, was once a siren of the silver screen. But the “talkies” were not kind to me and my grating East Coast accent.’ Whoops.” She looked up at Aubrey, who seemed to wave off the need for Anna to affect any accent. But Anna apparently wanted to try anyway, as she continued in a high, nasal tone: “‘Linguists tried and fay-yelled, and in the meantime I refused voiceovahs and threw enough fits to boyn bridges and lose leading roles to youngah, freshah actresses. My diva behaviah cost me my relationship with Phil also, so in time I fell outta fame and the public eye. Phil Theeritch reads his lines next’…oh.” Shaking her head, she motioned at Ken with her paper for him to take his turn. “Um” was all Ken said, looking at Aubrey. “Zeeb!” she hissed at Stacey. “What? Oh.” He walked to a side table and grabbed a small stack of thin booklets. Thumbing through them, he handed one to Ken. Stacey was quicker on the draw to hand Spence his booklet. The wannabe actor pretended to twiddle his slim, drawn-on moustache as he reviewed his lines, probably rehearsing them in his head first as if this could be his big break. Aubrey theatrically gasped at this, then nodded to Anna. “Dun-dun-DAH!” Spence sang to score that reveal. “‘Mothah?’” Anna read with zero feigned outrage. “‘That’s not what I agreed to. Well, I nevah! Storms in anger out of’—oh.” Ducking her head down, Anna scurried out of the parlor. Everyone giggled in equal parts confusion and amusement as Stacey distributed the rest of the character booklets to their respective players. Greer started flipping ahead in hers when a fan of feathers tapped her wrist. “Sorry.” She smiled meekly at Aubrey. “Oh. Right.” Kelly flipped to his opening pages and proclaimed, “‘Someone should make sure Anita is okay. I will follow her to the library.’ That sounded natural enough, right?” He grinned at his friends until Aubrey swatted the air with her duster as his signal to literally follow Anna out of the room. Grimacing, Kelly obeyed. And now the moment you've been waiting for... My lucky number is 16! Add it up with all the other lucky numbers and you’ll have the secret code to enter for the Grand Prize! 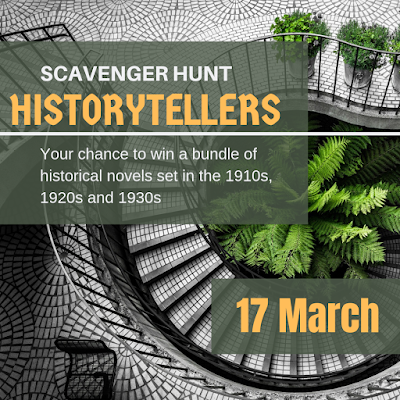 Save the Date: HISTORYTELLERS Scavenger Hunt on March 17! As you may already know, my fiction has a penchant for the past and paranormal--emphasis on PAST for this post. 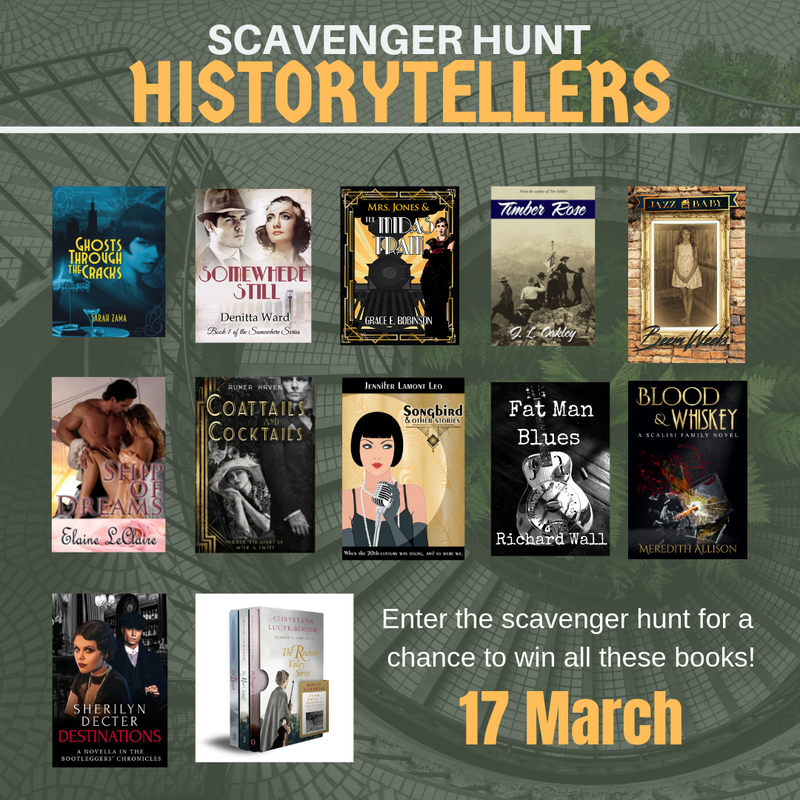 With two novels partially set in the late-19th and early-20th centuries, respectively, and one entirely taking place in the 1920s, I'm teaming up with fellow authors of historical fiction this weekend for the HISTORYTELLERS Scavenger Hunt! On Sunday, March 17th, 12 authors of historical fiction set in the 1910s, 1920s, and 1930s are joining together to offer a bundle of their books to one lucky reader--which could very well be YOU! Talk about the cat's meow. 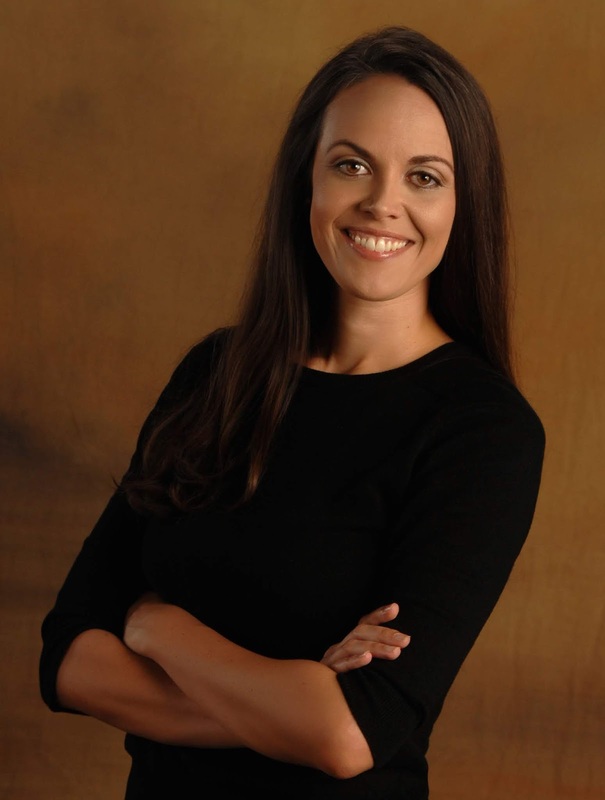 To find out how to participate, hunt organizer and author Sarah Zama has the rules at her website: https://sarahzama.theoldshelter.com/historytellers-how-to-hunt. Easy-peasy. All right, then. That'll do it for today. I hope you explore the links above, share them with others, and join us on Sunday for the scavenger-huntin' hootenanny! See you then, dears. And what about this, you may ask? Well, this is my recently repainted, yet-to-be-recarpeted spare room after it suffered some water damage from upstairs. I've lived in this flat for 10 years. 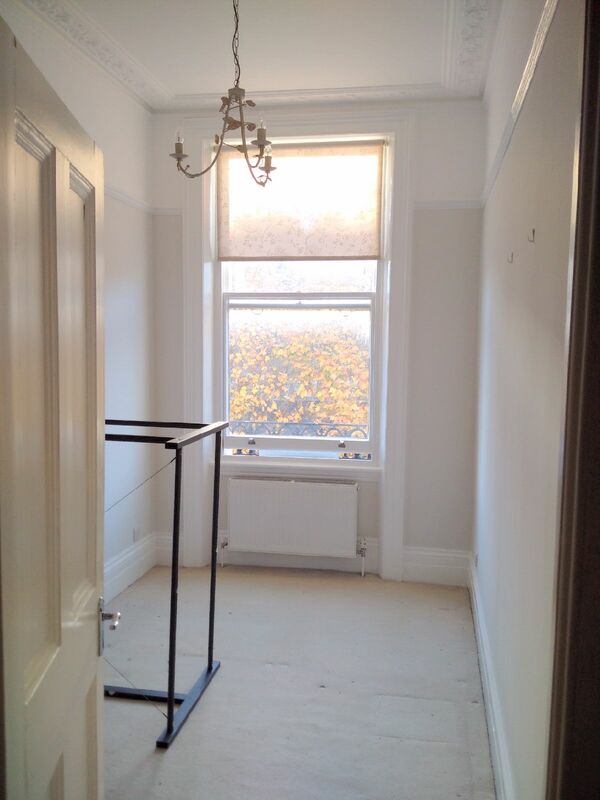 Yep, we're stupefying friends, family, and London lettings agents left and right with that one. Whether they realize it or not, my readers are already well-acquainted with this space--it's Rand's flat in my past-present paranormal novel, What the Clocks Know. And this particular room is where Margot has many-a haunting dream in her sleep... 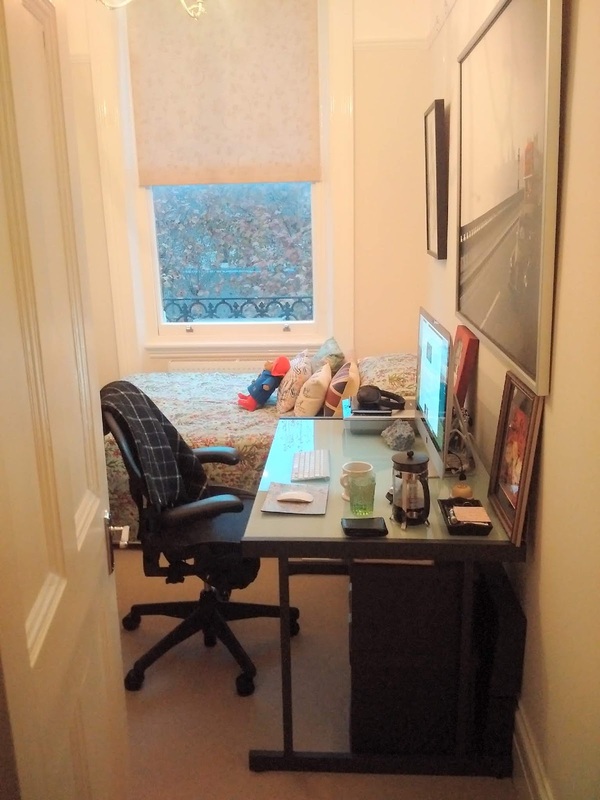 But to me, it's my office / guest bedroom / husband's closet. Oh, and I suppose bike rack (thanks to a very, very high ceiling). That's how we roll in London. Life in miniature. When we move out, it'll be like we were never here. None of this will disappear from our minds and hearts, of course. We're lugging all our memories with us when the time comes. Only for a cleaning crew to come through and wipe the slate clean behind us, leaving everything just as we'd found it in 2008. Just like every previous tenant/owner had before us and will after. These containers brimming with our lives...they just return to empty spaces. Since celebrating our 10-year anniversary in the UK, we've been reminiscing a lot about our time here, and somehow this whole water-damage/renovation fiasco has shifted our nostalgia into hyperdrive. So, at first I looked at this empty room where I literally started my writing career and felt such sadness that all that meaning will just get erased as someone else's blank canvas to paint on. I can't take it with me. But will it ever truly let me go? As I said to my husband the other day, "We're gonna leave so much energy behind in this place! The next tenants are screwed!!" And then we both laughed because we both know it's so totally true. These walls...they've locked us in. A part of us, anyway. We've energetically imprinted ourselves on this space, so in a sense will always be here, just as I believe a part of everyone else who's lived here still does, possibly affecting us in ways we don't realize. You don't have to be dead to haunt a place. And haunt places we do, which is what I like to write about. It didn't take moving to London for me to contemplate the spaces I live in and pass through, the people who've shared those places, and the individual and collective experiences to be had (and have been had) in them. The past always lives in my present, and I reckon the future does as well. Layer upon layer of life in a single space. I love them in all forms: in writing, in art, in music. [...] My favorite sorts of stories, however, are the ones that people tell about themselves. 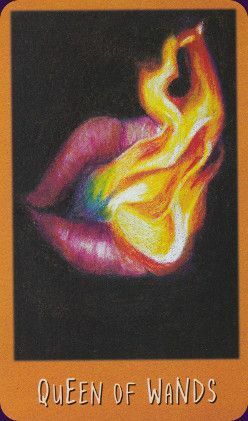 To me, that's the soul of tarot. Every spread is an opportunity to shape our current life events into a story with ourselves firmly installed as the hero at the heart of it. Stories are a way of imposing structure and control, and tarot is a way of imposing structure and control on our own spiritual growth. It's so true. And I'm finding my way back into storytelling through the cards. I've been studying tarot a lot lately, rekindling my interest after receiving my first deck several years ago. Since then, I've accumulated other decks to compare/contrast their symbolism and aesthetic, gauge how my intuition might work with each differently. And now as summer slowly fades into fall, I've been keen to work with decks that capture an autumn atmosphere. While not technically a seasonal deck, my newest one seems to deliver just that: The Raven's Prophecy. Created by Maggie Stiefvater, The Raven's Prophecy was inspired by her Raven Cycle young adult book series. I discovered these cards before the novels, so I'm eagerly reading The Raven Boys now! So far, it's ticking all the boxes of paranormal intrigue that I adore. At any rate, whenever I get a new deck, I interview it to get to know it better and understand how we might work best together. It's a very fun little exercise, and this deck straight away blew me away! First of all, I've been drawing a card a day from my traditional Rider-Waite-Smith tarot and sharing my personal reflections over at my original creative writing blog (you know, before I became such a diva and demanded a separate author site 😉). 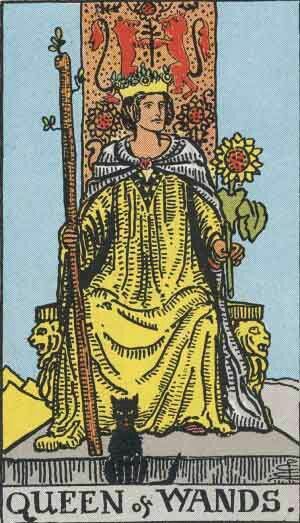 Well, today's card was the Queen of Wands, which fell face-up in my lap while I was shuffling. 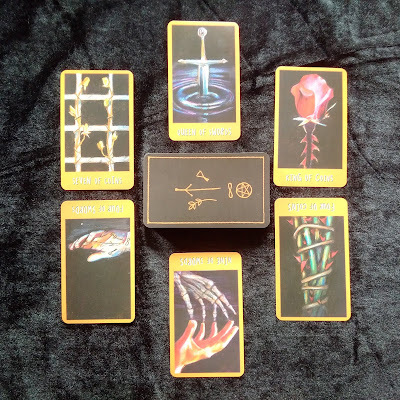 So this morning I blogged about what a passionate, creative, energetic spirit this queen is, and then this afternoon decided to interview my Raven tarot after its delivery. Right out of the gate, the Queen of Wands of that deck shot out of the pile. I mean, shot straight ahead with such force it almost startled me. She sure is a spitfire! And the longer I subsequently meditated on my tarot spread, the more apparent it became that the card-a-day I'd initially assumed was about me was actually heralding the arrival of this deck. A prophecy of the Raven's Prophecy, if you will. The deck is the freakin' Queen of Wands around here! Second of all, as I do read reversed cards, I left it as is when the entire top row of my spread was dealt upright and the entire bottom row was upside down. Automatically, I viewed this as a mirror reflection, the bottom reflecting the top. And just as I had this thought, I noticed the reflection pictured in the card closest to me (bottom-center in the photo above). Had I turned this card right-side up, then I may have lost the impact of seeing that hand reaching from where I was sitting to touch the bony fingertips of the skeletal hand reaching out to me from the deck--as if reaching to me from the other side, from a higher consciousness that knows the answers I seek, the ones already within me that I just have to recognize. Maybe you had to be there, but this shivered me timbers for sure. Awesome! 1. Tell me about yourself. What is your most important characteristic? Seven of Coins. I generally interpret this as patiently waiting to reap the fruits of one's labors, so I think this deck is telling me there will be no easy, quick fixes. Its advice will require time and effort on my part, but I'll ultimately be rewarded for it. 2. What are your strengths as a deck? Queen of Swords. This one cuts straight to the truth. Its guidance will be honest but fair, what I need to hear even if I don't want to. 3. What are your limits? King of Coins. Seems this deck will be down to earth but perhaps prickly and stern in its authority. Like the Queen of Swords, this King can draw blood with those thorns. 4. What are you here to teach me? Four of Swords (reversed). This could be a call for me to stop and rest to take stock of situations before I act on them, but given its reversal and the context of the spread, I think this deck is poking at me to get up and at 'em. Telling me that I tend to stall and take plenty of time to think, but that it's time to take action. To not take life lying down and instead be proactive toward my goals. 5. How can I best learn and collaborate with you? Nine of Swords (reversed). I need to get over my irrational fears and face the music this deck plays for me. As mentioned before, it may tell me things I don't want to hear, but it's in my best interest. I need to meet the deck halfway, not fearing what it has to say but trusting it and acting on it. 6. What is the potential outcome of our working relationship? Four of Coins (reversed). I feel like this one echoes its pals in urging me out of my comfort zone, encouraging me to not hold things so close to the chest and branch out. Perhaps in helping myself, I can help others. This is just a cursory interpretation, but needless to say, methinks this deck is going to be a little ball-buster! Yet in the best of ways. My only reason for practicing tarot is to hold a mirror to myself to help me see what I've otherwise been unable to (*ahem* Mirror, I say? Like the mirror image I commented on above? You bet I read something into that!). So I think this is the beginning of a beautiful friendship between the Raven and R.Haven. May we both have many stories to tell! It seems 2018 has found me in need of some incubation. After the flurry of writing, publishing, and marketing activity toward the end of 2017, I felt a bit emptied in the New Year, meandering without a muse. I didn't feel that special spark of creativity or drive. So, I decided to fill my cup through some self-care. When I read self-care guidance, I tend to feel guilty because it isn't as if my life is so hectic that I can't carve out downtime. I've got all the me-time in the world if I want it, to be honest. But it's what I was doing with that time lately that felt counterproductive, only getting me increasingly trapped inside my head. I'd never felt so scatterbrained or self-absorbed and just needed to grab the reins on my thoughts and steer them toward mindfulness. I needed to not get so caught up in myself but to give again, through my time, creativity, whatever compassion and talent I have to offer others. But it's tough to give when you're not operating at 100%. You know, the ol' put-on-your-own-oxygen-mask-before-helping-others-with-theirs schtick that you hear after boarding a plane. Having alone-time is not enough to find serenity, focus, and motivation--again, it's what you do with that time. You've gotta work at it. 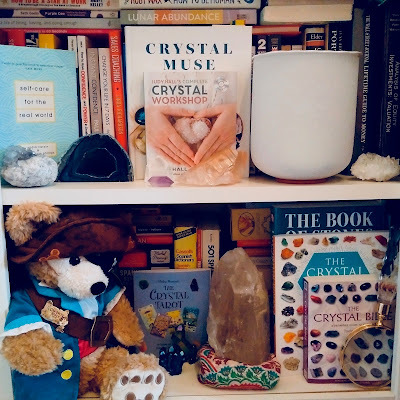 And so, a year after immersing myself in the sparkly world of crystals and steadily growing my collection and knowledge of them, I've established a new daily routine of morning meditation. 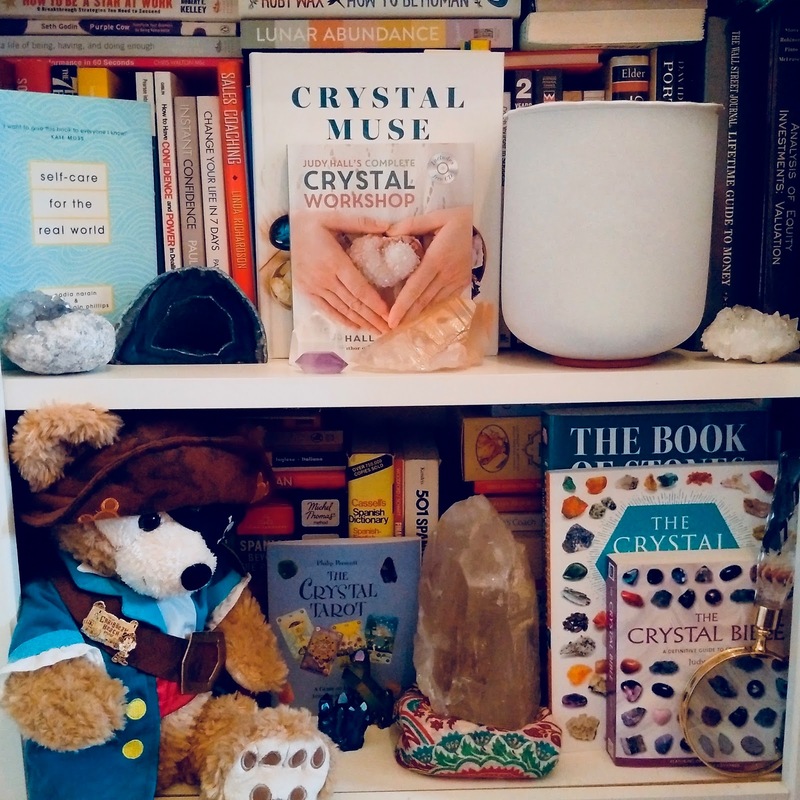 I have a tiny altar set up at the foot of my bed, where I've placed comforting crystals like rose quartz and amethyst, a Himalayan salt lamp, and assorted supplies for meditation and prayer (mala beads, rosary, palm stones, incense, etc.). I like to light a candle and ring a vintage sanctuary bell to cleanse the space and set a tranquil tone first, then I pop on some noise-cancellation headphones (with or without new-age music) to block out city sounds and will sit cross-legged on a cushion with eyes closed and crystals in hand for about 10-20 minutes. After this, I often shuffle and draw angel, oracle, and/or tarot cards to set my intention for the day. More recently, I've added evening prayer to this daily ritual, making sure I share my gratitude for the good and bad of the day and send blessings to loved ones and those in need. This has powerfully reconnected me with my faith, helping me appreciate its beautiful ancient rituals more than ever. 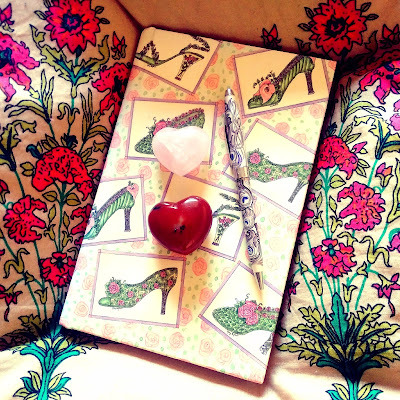 Tapping into my creative heart with rose quartz and carnelian hearts, a one-week ritual prescribed by Energy Muse. In any case, all of this moon-phase/crystal craze has been part of a greater self-care regimen that I adopted as a New Year's resolution. As I said, I've always been all about me-time--as an introvert, it's essential to recharging my batteries!--but I've felt like I could do more for me. Not as self-indulgence but self-respect. Had I been respecting my body, mind, and soul enough, fueling myself with what I truly needed physically, mentally, and spiritually? No, I don't think I was. So, I've been having a wonderful time researching and reflecting as I work to become the best version of myself. Only when I'm taking care of me properly can I be any use to others. It may sound like a bunch of touchy-feely fluff drifting outside the atmosphere of your rational, pragmatic world, but there's sound psychological (and sometimes physical) science to all of it. It's largely about training your brain to become more focused and aware, about gaining perspective on (and ownership of) your own life choices--and recognizing that, ultimately, you already know the answers to all your questions. Yeah. Our brains (and intuition) are amazing like that! Julie Montagu's Recharge also offers some super-simple tips on eating and exercising that support the mind as much as body. And while there's science, too, behind crystal energy (which I sincerely do feel across my chakras), these stones can at the very least offer tangible reminders of what we wish to be most mindful of and improve at any given time. Their colors trigger sensations (e.g., the calm of blue and the vitality of orange), and they might simply just look beautiful or feel nice to hold. If they can please or comfort you in some way--or even produce a placebo effect--there's no harm in them (unless you genuinely need medical treatment, in which case crystals are meant to supplement not replace!). 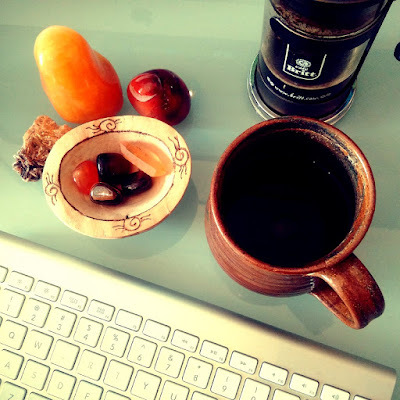 Caffeine and crystals for creative energy--fire me up!! I know it's been a long time coming, but since my new release last year, I am finally getting the gears turning on my next story. I'm quite excited to share that this will be my first book series, following a team of televised ghost hunters as they investigate paranormal phenomena at various lodging sites around the world (hotels, inns, motels, B&Bs, etc.). In any case, prior to writing that actual murder mystery, I was already priming myself to write about a murder mystery dinner, which will take place during my next book. Set in present day, this story will follow a group of friends spending the night at a quaint and historic bed and breakfast. They're simply gathering for a 1940s-themed mystery game (all decked out and acting in character), but personal conflicts simmering beneath the surface eventually come to a boil--ignited further by the presence of a TV ghost-hunting team seeking to confirm or deny claims that the property is haunted. 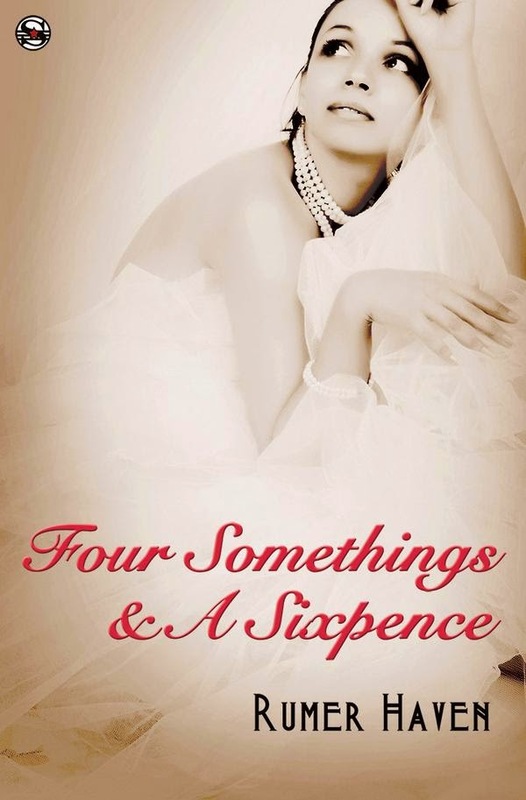 The end result will hopefully be a fun romp through contemporary romantic comedy, historical drama, and paranormal suspense--much in the vein of my debut novel, Seven for a Secret. I also expect it to be a standalone novella where this particular dinner party and B&B are concerned; the series will continue with the same paranormal investigation team, however, just at different locations involving different proprietors and/or guests. The Bee's Knees of A-to-Zs! Click the chicks for some nifty 1920s slang. 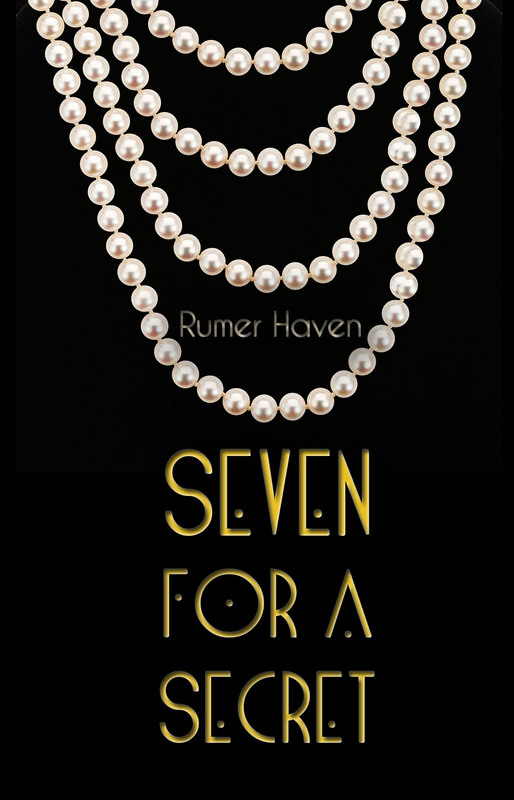 © Rumer Haven 2013. Powered by Blogger.